is a small firm practicing environmental analysis, design and planning. The ecological emphasis of the firm focuses on the documentation, protection and enhancement of natural resources on a regional level, and public environmental education and community outreach on a local level. 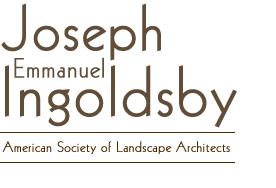 We utilize environmental design and construction, lectures, gallery and site installations to broaden the public's understanding and appreciation of the native landscape. Further, we are capable of completing promotional materials using graphics, computer illustrations and web design to market and publicize concepts and planning for local and regional projects. Private work includes: Site analysis, historic research, landscape design for corporations, private homes and estates, country farms and city townhouses. Being located in New England, private work includes designs for coastal conditions, seaside gardens and landscapes, coastal bank restorations, pond reclamation, stream corridor enhancement and natural storm-water runoff retention systems. Sustainable farm and habitat restoration to encourage bio-diversity and plantings for wildlife are specialties. Landscape analysis and design of the wetlands, perimeter buffer zone, parking-lot plantings. Landscape analysis, design, wetland permitting. Interactive work of water temperature and nutrient analysis from Boston Harbor to the tidal rivers tied to thermal mapping and the seasonal runs of smelt, herring and shad. Multimedia Installations charting the spawning runs of anadromous fish using scientific sampling, computer mapping, satellite imagery and interactive web work. Natural and cultural landscape analysis and research, CAD and GIS data collection for computer mapping, plots and report with Rizzo Associates, Inc. Design recommendations for the enhancement of the natural and cultural landscape, Writing and illustration for reports. Community outreach. Local, county and state coordinated proposal to restore anadromous fish habitat, create a river corridor open space network, and develop maintenance and education programs to protect and interpret natural and cultural resources. Multi community and state agency proposal to protect, enhance and restore the natural and cultural resources of the Neponset River Estuary. Input to MA. GIS program for resource and boundary delineation on GIS map. Input into current MA. 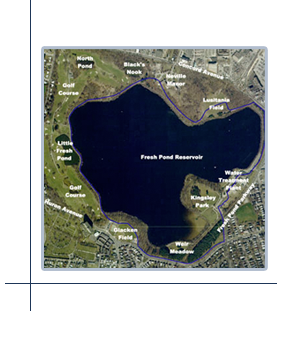 D. E. M. Management Plan for the Neponset Estuary. in collaboration with Fugro McClelland (East) and the MA. Division of Marine Fisheries. Neponset River Basin: Fowl Meadow and Ponkapoag Bog A.C.E.C. A thirteen community proposal to protect the main stem of the Neponset River through the delineation of a 9,000 acre reserve. Documentation of the significant resources and rationale for their protection.